Privileged Access is a collection of fifteen essays which attempt to grapple with the question of how we can know our own feelings or mental states. Those with a background in analytical philosophy may be aware that 'self-knowledge' doesn't actually mean or refer to anything we could associate with 'self' but corresponds to 'introspection' or 'epistemic access' towards some property or attribute of the mind, such as desire or belief. It is uncontroversial to hold that most of us experience the world around us, as embodied beings. So when philosophers such as Fred Dretske, whose paper 'How Do You Know You are Not a Zombie' talks of 'mind-independent objects' one has to ask why he doesn't refer to physical objects instead? If we accept some version of the appearance/reality distinction we may be tempted to say that something obviously is itself regardless of its appearance to any observer. But to say that an object exists without me does not entail, as Dretske claims that 'nothing distinguishes your world' (1) -- of course it does. The object I see may be the 'same' in its primary qualities (weight, shape and so on) but this does not entail that it has the same affect on me as it does on you, as anyone who has studied fine art is all too aware: we may refer to the same referent but make different sense of it (as Gottlob Frege pointed out in his seminal paper 'Sense and Reference'). Dretske thinks he has hit on something truly interesting when he raises the question -- how do we accommodate the difference between feeling something and not feeling it? Is it because consciousness of touch, is always intended towards a spatial object, which, at that moment is not present? No, the answer lies in 'knowing what is going on in our own mind' (13). This surely begs the question: when did the mind become divorced from the environment, from its body? Chapters two to seven concentrate on how we may account for self-knowledge, or in other words, justify our beliefs about ourselves. But this raises a host of questions, not least concerning whether each of us is truly reducible to a set of beliefs. In attempting to answer this question Sydney Shoemaker, whose paper 'On Knowing One's Own Mind' was first published in 1988, claims that beliefs follow a certain order. For example, 'excess acidity in my stomach may produce in me the belief that there is excess acidity in my stomach' (112). But why? Surely most of us do not follow a sensation of pain with a belief about that pain. Rather, in this case, we assign 'acidity' to the sensation we feel, thus making the sensation and the idea of the sensation one and the same thing. Shoemaker would have us belief that C-fibers fire one minute, followed by 'oh, I feel pain' the next. This is like saying 'Oh, I just realized, "I have a headache"'! Charles Siewart, whose paper forms the ninth chapter of this book, thinks it self-evident that 'one knows one's own thoughts'. But arguably we don't know our own thoughts, we have them -- knowledge arises only when we question whether any of our deeply held thoughts -- those we call opinions or beliefs, are true or contingent. This however, raises an entirely different set of concerns, not about knowledge of our thoughts, but about the content of our beliefs --though the philosophers in this book would have us maintain that all our thoughts are beliefs, with knowledge being no more or less than 'justified true belief'. That very few non-analytical philosophers maintain this theory of knowledge is barely recognized. Dorit Bar-On and Douglas C. Long's account of the self is clearly rooted in a behaviourist theory of mind and in a psychological understanding of 'self-hood'. Our 'selves' can be known just as well by other people 'I may not be aware of how self centred I am until someone else points it out to me' such that we may learn about ourselves just as well from 'a trained therapist' (179). One wonders where the 'trained therapist' got to have so much insight into the human condition and how she can know, better than I, my mental states and moods. This position seems extraordinarily reactionary, though politics, of course, is not part of the question. Some justified relief is found in chapter thirteen, in José Luis Bemúdez paper, which unusually for this collection, begins by attempting to define 'the self' and problems of identifying it. For this reason alone, Bemúdez paper would have been best placed at the very beginning of the book. For instance, clarifying the differences between Hume's position 'the self ... is nothing over and above a "bundle of thoughts"' and Descartes' 'who thought that we are never directly acquainted with the thinking "I"' (214-215) puts into perspective the other papers in this collection. All we can be aware of, according to this interpretation, are thoughts -- since a substance -- in this case our 'self' is something of which we are aware, but can never know. At this point, however, Bermúdez would have done well to either concede that we have no 'self' and therefore nothing that can pertain to self knowledge or to try and extrapolate a self e.g. by showing that Descartes was wrong, and we can know the thinker behind the thought for the self is more than a bundle of thoughts. 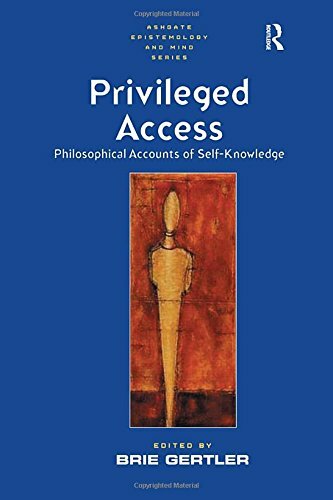 But like the other authors in this book, Bermúdez wants to show that the whole idea of privileged access is problematic (at least that's what I think he is attempting to show). But if we refute the very idea of an unknown or unknowable self and the idea that we are no more than a set of beliefs or a bundle of thoughts (and it's not hard to find people who disagree with this position), then this book will leave the reader empty, since it presupposes a notion of mind that many today find alien. In response, we need to ask why a collection on philosophical accounts of self-knowledge couldn't have grappled with other notions of self, such as atman or conatus, or if not, how such a collection managed to exclude the postmodernists 'death of the subject'. This book will not appeal to anyone outside the Anglo-American tradition and will appear a feeble attempt to explain the nature of mind to genuine cognitive psychologists who, however, may at least enjoy the debate. Unlike their doyen -- Descartes -- without whom, this book could never have been written, the authors of Privileged Access have little to say on the human condition, which has been reduced to a set of beliefs which, for some reason, each of us is required to justify. It would have been interesting to have shown various ways in which the self can, and has been, interpreted, aside from the Cartesian and Humean models: but think on this: if philosophers have a problem accessing the basis of a self which is at heart empirical -- how is it possible that over a billion people maintain a notion of self which is intimately connected with all other selves and for which its own beliefs are mere illusions? I would like to have seen the philosophers in this collection tackle this question, from an analytical point of view.